Until a few very short weeks ago, Bali had been an elusive and exotic paradise in Southeast Asia. It was a place where only the world's most seasoned travelers, most adventurous backpackers and most elite vacationers got to experience. To me, Bali represented everything I longed for in a holiday - exposure to culture, spirituality, adventure, nature and, of course, the clearest waters and finest beaches one has ever laid eyes on. Until a few very short weeks ago, Bali was just a dream. Now it's a memory. Following fifteen hours of flying with Air Asia that included nothing less than a free red velvet cupcake and an in-flight game show, I landed at Ngurah Rai International Airport in Bali. I was immediately struck by the heat and humidity that Bali offered, absolutely ready for an amazing ten days in the sun. Our tour guide met us at baggage claim and we drove into Bali's main tourist city, Kuta. Some describe Kuta as a mini version of Bangkok (not that I've ever been there). What this basically means is that it's super busy and a little smelly with sunburnt tourists roaming the streets at all hours of the day and motorbikes swerving all over the place and driving on the wrong side of the road. It definitely was not what I was expecting from Bali, but I couldn't help but love the rush of it all. I have to be honest and say that Kuta wasn't necessarily my favorite city, and I think most tourists that visit Bali would agree. It's a great place to spend a day or two, experience the nightlife and chill out on the beach for a bit. Regardless, I had an absolutely amazing time during my stay there. This was definitely due to the amazing group of people that I was surrounded by on my tour. As a young tourist/adventurist, I cannot stress enough how great it is to join a tour group while traveling - it's basically a guaranteed group of friendship and fun. Somehow even frantically running to our hotel in the middle of a torrential downpour felt like an adventure with such a lively group. One of the positive aspects of Kuta is how close it is to some major cultural attractions, including beautiful, centuries-old temples. We had the chance to visit two of these, Tanah Lot and Uluwatu. Tanah Lot is a temple that was built late in the fifteenth century upon a rock formation in the sea. The temple itself is an absolute vision, even on a foggy day. Though visitors are not welcomed to explore the temple, you are still able to experience the spirit it embodies by listening to the chants and hymns that are sung by local Balinese from inside. There are plenty of other Balinese cultural experiences to enjoy in the area surrounding the temple, including traditional musical performances, prayer centers, local food and, of course, amazing views. Uluwatu differed slightly in that we had to wear traditional garb in order to respect religious beliefs while inside the temple. We had to walk quite a bit to actually reach the temple, which stood grandly on top of a cliff overlooking the sea. There were also vicious monkeys standing guard at every corner that would jump at the chance to steal a bag of chips out of a careless tourist's backpack. The temple itself is beautiful, and I appreciated the chance to explore it more closely than I did Tanah Lot. If anything, I wish I could have seen more temples while I was in Bali because they are each so unique and offer their own view of Hinduism and Balinese culture. In addition to the traditional and cultural excursions that I enjoyed in Kuta, I also was able to have some more fun and modern experiences. My favorite of these was having a surf lesson at Kuta Beach. I was a bit apprehensive at first for two reasons. The first was that being away from the safe waters of the the Northeastern United States, I was truly scared that there was something poisonous and deadly lurking in the waters waiting to attack. The second reason was because I had been to Kuta Beach a few days prior and had seen the waves start to swell to a height that was easily twice the size of me. Despite these fears, I ran excitedly into the water once our on-shore lesson had concluded and was standing up on my board by my second wave. After that, I didn't want to stop. At the risk of sounding like a total geek, I would describe my surf experience as "totally awesome dude". You can be sure that I'll be hitting the waves again in Australia and as soon as summer returns in the states. Following our four days in Kuta, we moved on to the more traditional Balinese town of Ubud. You may recognize Ubud as the part of Bali that Elizabeth Gilbert visited in her memoir, "Eat, Pray, Love". My love for her story made me particularly excited for this leg of the trip. I was so ready to explore local markets, interact with more people and feel more connected to nature. This was definitely easy at our first stop at the Tegenungan Waterfall. After walking down 150 steep and uneven steps on a hot and humid day, I couldn't have dove into that waterfall fast enough. I'd never swam in a waterfall until then and after that experience I would definitely do it again. The most amazing part was climbing and swimming behind the falls, a feat that proved extremely dangerous, but totally worth it, with slippery rocks and strong currents. While in Ubud, we also visited a famous monkey forest, taught English at a local school, enjoyed lunch overlooking an active volcano, tasted the most expensive coffee in the world and explored the world renowned rice terraces. The monkeys that we saw were much nicer than those that we encountered at the Uluwatu Temple, but still wouldn't hesitate to attack and grab a banana right out of your hand. I'd be lying if I said that I didn't just drop my banana and quietly screech as soon as I saw one of the larger monkeys running toward me with the look of hunger and attack in its eyes. Being the skiddish traveler that I am, I of course read the few horror stories of people being attacked by monkeys in these kinds of forests and didn't want to risk anything. Later that afternoon we explored local markets to look for souvenirs and my negotiating skills were put to the test. I definitely failed, but still walked away happy with two surfboard table decorations to remind me of how in love I fell with surfing in Bali. The next morning we went to a school where we taught English by playing various games, including "Simon Says" and doing the Hokey Pokey. There's nothing I love more than reconnecting with my childhood and spending time with kids. The experience reminded me a lot of my time in Costa Rica last March where the classrooms lacked the technology and luxury of those in the states. And just like in Costa Rica, I was amazed by how smart and excited to learn all of the kids were. Later that day, lunch overlooking the volcano, Mount Batur, offered incredible views and a delicious all-you-can-eat buffet. You could still see the lava that was left from its last eruption in 2002. If you ever have the chance to go to Bali, please take the time to climb Mount Batur and take in all of the beauty that its surroundings have to offer (I hear that it's best at sunrise). I didn't have the time to do this myself, but really wish that I had. After lunch we headed on to a coffee plantation. In case you didn't know, Bali is known for having the most expensive and luxurious coffee in the world, known as "Luwak" coffee. If you try to order this type of coffee anywhere else in the world, chances are you'll pay around $100 for a cup. I paid five. You're also probably not aware that Luwak coffee is so special because the beans first pass through a special Balinese cat, or a Luwak. Yup, the beans come from cat poop. Don't worry, the shells are peeled off and the beans are thoroughly washed after this so it's not gross (well, that gross). And it sure does make one damn good cup of coffee. Our last excursion in Ubud was a tour through the beautiful rice paddies. This is one of the most famous attractions in Bali, and for good reason. Around every turn was another beautiful view and an opportunity to experience traditional Balinese life. We were even serenaded by a local man whose family has worked on the terraces for generations. Overall, Ubud did not disappoint and offered me a beautiful perspective on Bali. The weekend approached and it was time to move onto our final destination, Gili Tawangan. Gili Trawangan, or "Gili T" for short, is technically part of Lombak. It is a small, beachy island where the only methods of transportation are bike and horse and buggy. You won't find a single car anywhere. The streets are packed with young backpackers at any time of the day, most of them holding a beer or cocktail in their hand as soon as the bars start serving. After enjoying some relaxing time at the beach, we took a bike ride to the opposite side of the island to watch the sunset. Almost any Bali travel brochure will feature a photo of a swing perched in the middle of the water where you can sit and enjoy the perfect sunset view (see below). The reality isn't that you just sit and enjoy while the sun sets, but rather race to beat all of the other tourists who want a picture to get a perfect shot at exactly 6:11 p.m. and then scurry off once you've gotten one that's Instagram-worthy. Aside from that brief chaos, it's a beautiful place to enjoy happy hour, unwind from a day in the sun and reminisce with friends about how much fun the week has been. For dinner that night, we went to a food market where local fishermen served up the day's catch traditional Indonesian style - with rice and a variety of sauces that make your mouth water. It was by far the best food that I'd had during my entire trip and washed down perfectly with the local beer, Bintang. The next day was the final day of our tour and we spent it snorkeling in the crystal clear waters surrounding the island. Our group of 23 squeezed onto a small, traditional glass-bottom boat and headed out to our three snorkeling destinations, which included a shipwreck, a coral reef and a sea turtle sanctuary! We saw so many exotic fish and drop-offs where the depth went from a couple of feet to a dark, unending abyss. My favorite spot was, without a doubt, the sea turtle sanctuary. We were surrounded by dozens of sea turtles that immediately reminded me of Crush from "Finding Nemo." I couldn't help but imagine that they were all 200 years old and had a little offspring named Squirt. We were able to get so close that we could have touched them, but I didn't dare scare or disrupt them in their natural habitat (as tempted as I was to ask for some fin and noggin...dude). My only regret is that I didn't have an underwater camera. That night everybody on the tour said their sorrowful goodbyes. Even though I had only spent a few days with those people, I was so sad to realize that my time with them had come to an end. They were some of the most interesting, funny and good-hearted people I have ever met and I didn't want to think that I would never see any of them again in my life. One of the hardest parts about traveling is accepting how many faces are just going to come and go despite how much of a connection you make with them. I like to think that maybe my path will cross with some of theirs again in the future, after all, crazy things happen when you set out to see the world. But goodbye was not the end for us! We still had two days left on Gili T to do some exploring on our own. Over our final two days we synced up with a few people from our tour who were also staying on Gili T. We enjoyed paddle boarding and hung out on the beach for a couple of hours to recover from the long and crazy week. We biked to the other side of the island and hiked up to a viewpoint where you could take in 360 degree views and then enjoyed another night watching the sunset and sipping cocktails. The next day we attended a boat party, which was advertised as "the wildest and coolest party in all of Southeast Asia". The boat was packed with over one hundred other tourists who wanted nothing more than to let loose and have a good time. 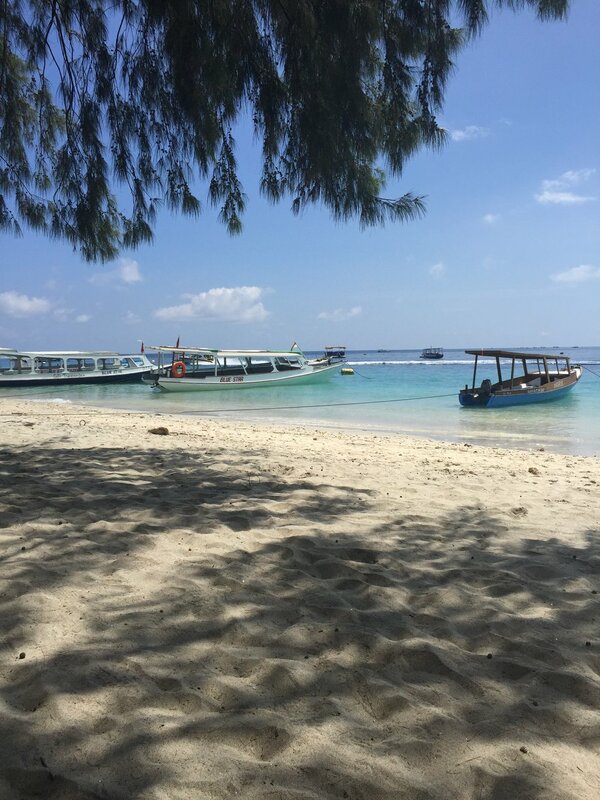 The boat toured all through the Gili Islands and we stopped off the coast of Lombok to go for a swim. Time seemed to disappear on the boat as you danced, chatted with strangers and basked in the pure freedom of each moment. I wouldn't have wanted to spend my last day in paradise any other way. The party continued off of the boat and raged on for so long that we got to see the sunrise, which was a view I'm glad I didn't miss. It dawned on me that my ten days of sun had come to an end, but I couldn't help but smile at all of the amazing memories that I would carry with me once I left. I feel like I could go on forever about my time in Bali. I could write pages describing all of the interesting people I met, all of the amazing food that I ate, terrifying taxi ride to the airport and so much more. The truth is that I absolutely had the time of my life and am so happy that everything I experienced exceeded my expectations. I can assure you that Bali is not just for the world's most seasoned travelers, most adventurous backpackers or most elite vacationers. It is a place for whoever wants to enjoy and appreciate all of the beauty, culture and fun that is has to offer. It is a place that I will remember forever and hope to return to one day to make even more memories. But for now, it's onto the next adventure. **If you have any questions about my experiences in Bali, please feel free to reach out in the "Contact Me" section. I'd be happy to answer any questions about where to stay, what tour I went on, budgeting, literally anything! Best wishes in all of your travels!